Citrine is part of the quartz family and is mined in Brazil and Bolivia. It is often found naturally near amethyst deposits. It is believed that natural citrine began as amethyst but was heated in the ground by thermal activity changing to the yellow to orangey hues. Today most citrine on the market is pale amethyst that has been heated creating the yellow to orangey yellow hues of citrine. The color is due to trace atoms of iron in the quartz. The finest colors are yellow through reddish orange all free from brown tints. 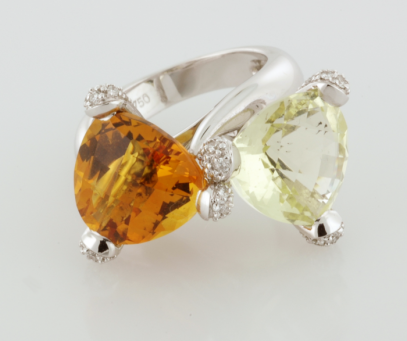 Citrine’s durability and affordability makes it the most popular gem in its color range. The Romans were the first to use citrine, often wearing it as a cabochon. It was thought to protect the wearer from evil and poisonous snakebite. It is also known as the “healing stone”, bring vitality, health, energy and warmth to the wearer.